A couple months ago, I attended a Pokémon-themed party. 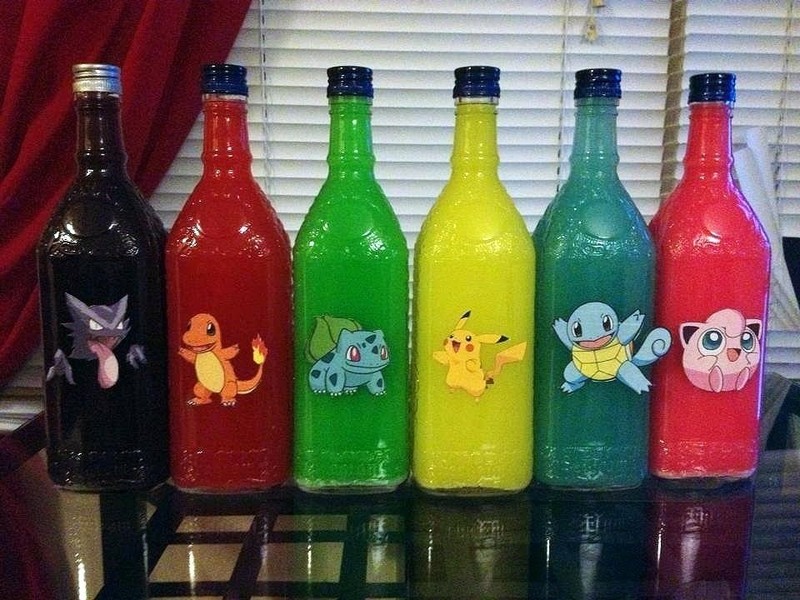 Everyone dressed as their favorite Pokémon or trainer, Poké balls flew around the backyard, and more importantly, there was a lot of Poké booze. 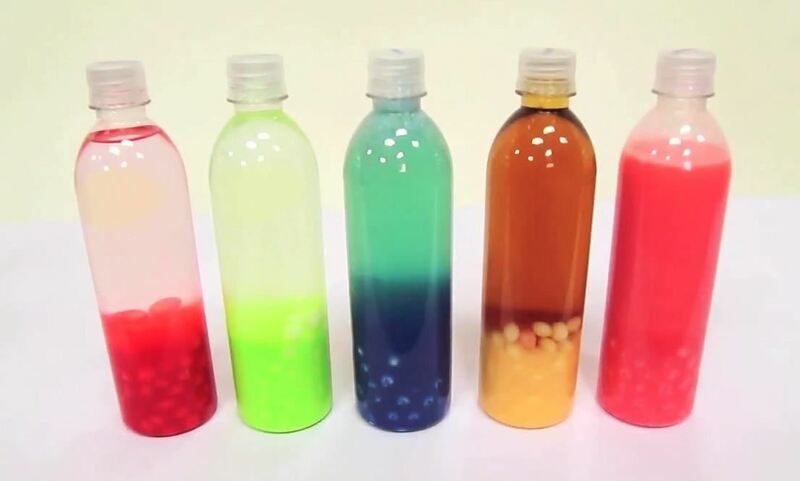 My friend who created the colorful drinks you see below informed me that they were infused with Skittles. This, my humble readers, was a defining moment in my life. I had just turned 21 and was a novice to all things alcoholic, so the thought of infusing a delicious candy with a horrific-tasting beverage was mind blowing. To be honest, that night was a little hazy, which may or may not be a sign of how delicious these drinks were. Either way, it begs the question, "Can Skittles save other drinks, as well?" For Skittles-infused booze, simply fill the bottle about halfway with Skittles, and the rest with booze. Let it sit overnight, then shake, pour, and imbibe. Rob and Corinne over at ThreadBanger take the plunge to uncover which mixtures are tasty, and which are just gross. Note: In their taste tests, they were using Skittles Candy Desserts, which individual flavors include Raspberry Sorbet (red), Blueberry Tart (blue), Key Lime Pie (green), Orange Creme (orange), and Strawberry Milkshake (pink). Skittles & Booze: Tasty or Gross? The first one they tried was the tequila with Raspberry Sorbet flavor, and both had differing opinions. Corinne found it okay, while Rob fake-puked, but for many, that's just standard tequila fare. Would I drink it? Hell yea! Don't judge me. Next up was the Key Lime Pie Skittles infused with vodka. I'm a little biased here, as any lime-flavored candy has no business amongst the awesomeness of orange, cherry, or really just about anything else. But, to each their own. My own prejudice aside, both seemed to really enjoy it, and in reality, Skittles and vodka is the go-to for candy infusion. The third concoction was the Blueberry Tart Skittles and wine, which both seemed to enjoy. In reality, white wine infuses well with just about anything, so it makes sense that it worked well with Skittles. Now the scary one—Jack Daniels with Orange Sherbet candies. As we all could have guessed without trying it, this one didn't go over so well. In fact, Rob likened it to the taste of "old people," and frankly, I've never been so turned off by the thought of whiskey. Lastly, Strawberry Milkshake with Sprite, which was flat and unfortunately, not alcoholic. Corinne liked it, Rob thought it tasted like Skittles (duh). Really, why even bother? From left to right: Raspberry Sorbet + Tequila; Key Lime Pie + Vodka; Blueberry Tart + Wine; Orange Sherbet + Whiskey; and Strawberry Milkshake + Sprite. Raspberry Sorbet + Tequila = Meh. Key Lime Pie + Vodka = Good! Blueberry Tart + Wine = Good! Orange Sherbet + Whiskey = Why would you do that to yourself?! Strawberry Milkshake + Sprite = Why bother? Now that you're armed with the "facts," go infuse some candy with your booze for your next party...or lunch (we're not judging). Have you tried other other infusions? How'd they taste? Let us know in the comments below, or tweet at us or leave a Facebook post with your thoughts. A bar I used to frequent did this with vodka in the early 2000s so it's not a new fad. They used Cherry Lips, Black Jacks, Fruit Salads, Cola Bottles, and other popular British pick 'n' mix sweets. You can have whatever opinion about alcohol you wish but just don't impose your opinion on others. just remember that pure extracts cannot be made without alcohol.